Just as many people are trying to eat less processed food to improve their health, some dog owners are turning away from conventional pet food. 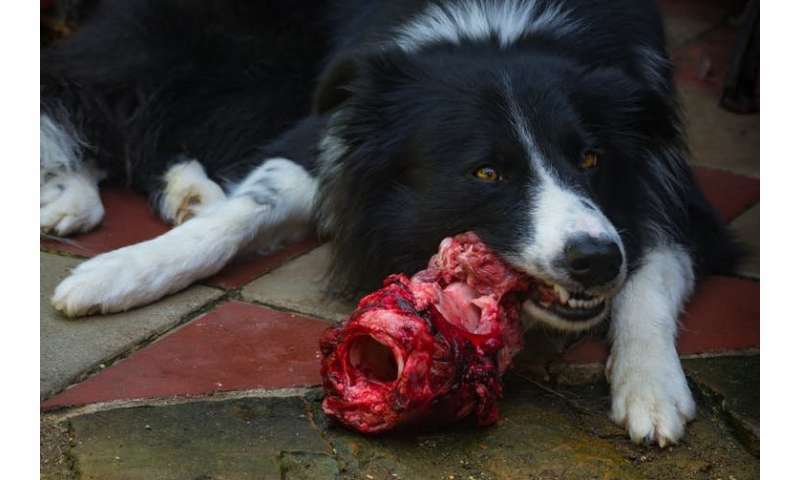 Instead they're trying to get back to what they see as a more traditional "butcher's dog" diet of raw meat, albeit with pre-prepared products that can be served easily and frozen for convenience. First it's worth pointing out that the evidence for the health advantages of raw meat-based diets is limited. Some research suggests they may enhance an animal's overall digestion (and so the size of their poos). But robust comparative studies are rare and there are still concerns about whether some of these diets provide enough nutritional value. Domestic dogs aren't like wild carnivores. They have been evolving alongside humans for approximately 30,000 years, and their diet has been shaped by our own food and environment. They can easily survive on a mixed diet, often on waste from human settlements, and have even evolved to digest starch. The recent study in the Veterinary Record analysed 35 commercial frozen raw meat products from eight different brands. It found E. coli in 28 products, Listeria monocytogenes in 19 of them and Salmonella species in seven. Several products also contained parasites. Other studies have previously highlighted similar contamination of raw pet food in Canada, North America and New Zealand. By comparison, unprocessed raw meat from the butcher is less likely to be an issue than the products in the study, in the same way it is safer to eat rare steak than raw mince. The problem is that there is no study comparing commercially produced raw dog food with small batches of raw butcher's meat, so we can't be certain about how much riskier these manufactured products are. 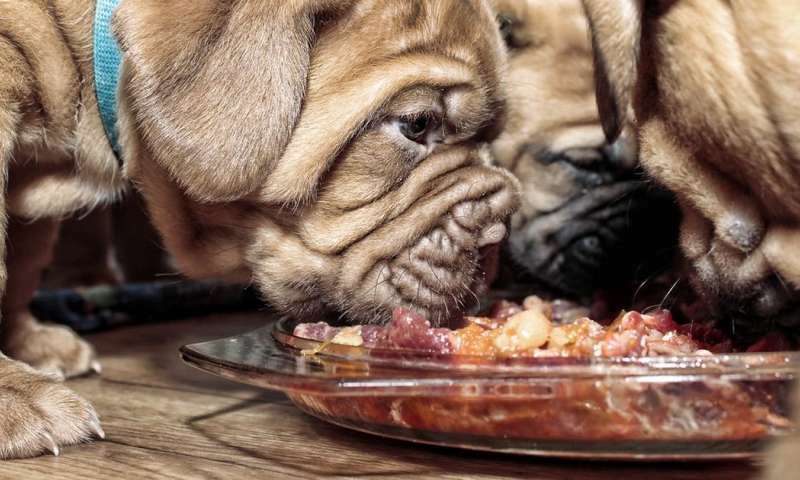 For dogs, the bacteria and parasites found in food aren't actually that much of a problem. Dogs are pretty resistant to many of the possible bugs that can be isolated from raw meat and they rarely become ill, though they can suffer gastric illness as a result of Salmonella. But dogs can become carriers of these bacteria and spread them through their faeces, which can lead to serious illness in humans. What is especially significant is these food products' level of contamination with bacteria that are resistant to treatment with antibiotics. This is a concern for both pet and human health. Infections with these bacteria are increasingly difficult to treat, and the spread of antibiotic resistance is a critical public health issue. The parasitic pathogens found in the products can cause significant health problems, but aren't as common and can mostly be inactivated by freezing the food at -20℃. For all the threat that this contamination poses, it's worth remembering that many human food products are full of similar bugs. The UK Food Standards Agency recently reported that antibiotic resistant superbugs were found at record levels in supermarket chickens. Even bags of salad can contain Salmonella. Where the dangers from pet food differ is in the fact that pets can pass on bugs after they've eaten. Owners can become exposed in a range of ways such as direct contact via touching, petting, exposure to saliva and faeces and even sharing sleeping spaces. Bugs can also be passed on indirectly through contact with contaminated surfaces such as floors and toys. But sensibly handling, cleaning and caring for your dog should minimise the risks. Wash your hands with soap and hot water after handling your dogs' food and after poo picking. Store human and pet bowls and utensils separately and, if possible, keep your dog out of human food preparation areas. With a little education and awareness, it is possible to go for raw food and minimise the potential risks. "They have been evolving alongside humans for approximately 30,000 years, and their diet has been shaped by our own food and environment." Pet "food" has been around maybe 40 years, so no, pets are not adapted to eat dry stones of junk....it is just an excuse to sell us the waste products from farm factories. If you want to nourish your pet you must give them not only muscle meat but also organ meats and a variety of other real foods that guarantees to cover all the nutritional needs for macro and micronutrients, and healthy gut microbiome, so the poor animal don't have to process that junk that finally ends as mega sized poops, all that waste signals to the poor quality of pet foods, when normally carnivores have mini sized poops. Pet food is as healthy as junk food for humans, but is highly profitable. Give your pets real food, cook it if you want to avoid parasites, but don't give them highly processed junk.